Recycling is the art of recreating an innovative product from your used old stuff. This creates a new purpose for thrown away things. We don’t have to search for expensive hangings that decorate your home. Instead, choose a wine bottle cutter to create wonderful home decors. Glass bottles are often thrown as trash. We can cut these bottles and use them in a creative way that decorate our home and garden. There are different methods to cut a glass bottle, make sure to invest in the right process and acquire more results. There are lot of bottle cutters available in the market. Bottle cutting is made easy with the help of these bottle cutters. There are bottle cutters with advanced features and affordable price. So, it’s easy to create beautiful candle stands, wind chimes, green garden or lanterns with the help of these bottle cutters. Step 1 – Before throwing into the trash, check whether the bottle is reusable. If it’s reusable, then make sure to clean the bottle. Remove all the dirt or grit because it may get stuck in the bottle cutter. Step 2 – Wines bottles and beer bottles find easy to get cut. Now, take your bottle cutter, place your bottle into it by adjusting the length and breadth. Fix the bottle tight with the screws. Step 3 – After setting the bottle right, score or turn around the bottle with the help of sharp blades attached on the bottle cutter. This scoring creates a perfect line of cut on the glass. Step 4 – Now, pour cold water on the bottle. This separates bottle into two parts. Step 5 – Finally, sand the bottle and create a perfect finish for creating wine bottle crafts. Bottle cutter is not only the option to cut bottles. Beer bottles are normally weightless and easy to crack. So, you can use simple steps to cut these bottles. How to cut a glass bottle with a nail polish remover? You don’t have to search for expensive bottle cutters, instead get these simple things like yarn and nail polish remover to cut your beer bottle. This works as a best beer bottle cutter. Step 1 – Choose a beer bottle, because it’s easy to get cracked and the glass walls are thinner compared to other bottles. Step 2 – Take the bottle, choose the yarn. If you don’t get yarn, then choose a thick cotton string. Step 3 – Now, take the yarn and tie it around the bottle where you would like to separate the bottle. Wrap it around up to 3-4 round and cut off the excess string. Step 4 – Now, slide off the yarn from the bottle and soak it in a dish of nail polish remover or the acetone. Wait until it’s completely soaked. Step 5 – Now, tie the yarn back to the bottle. Light the yarn on fire and burn it consistently. Step 6 – Finally, dip it in the cold water to cut the glass. Take a look at the steps to follow, while using boiled water. Step 1 – Initially, take a plain glass bottle. Step 2 – Now, you should create a tension line where you need the bottles to get cracked. Set the break point by scoring along the line. Step 3 – You can use a glass cutter or a glass drill to create a single line across the bottle. Make sure that you don’t overlap the lines and jag it. This may create problem in the final output of the product. Step 4 – Keep your sink ready with running cold water and a kettle of hot water. Step 5 – Now, pour the hot water on the scored line. Don’t cover wide area, but pour according to the size of score line. Step 6 – After pouring hot water, now move the glass bottle into the running cold water sink. Bottle will not break for the first time. Step 7 – So, continue adding cold water and hot water over the score line. Finally dip it in the cold water to snap of the bottle easily. 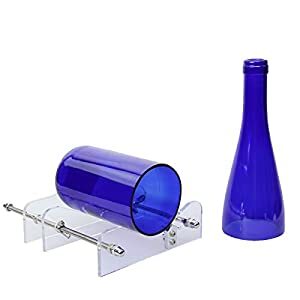 We don’t have to move around for decorative items, but create of your own with the help of glass bottle cutter. There are lot of ways to cut the glass bottles or wine bottles, but it’s essential to choose the perfect method. Make sure the method is safe and you get the best output.